Anywhere from mid-5-minute miles to mid-6-minute miles depending on the race. Too many to list! Definitely Boston for the prestige, New York for the crowds, Lake Tahoe for the scenery, and California International because I PRed there. Tahoe Trail Bars, they’re made locally and taste great! Running: A sub-2:40 marathon. Professionally: I’d like to write a book someday. Running has shown me that anything is possible if you work hard enough to attain it. I run because I cannot imagine a life without running in it. There are so many! But if I have to choose…My mom has been my biggest supporters for as long as I can remember and has been to every race I’ve run. The 2011 New York City Marathon fell on mom’s birthday and she said all she wanted from me was a PR in the race. I ran strong, kicked hard through Central Park, and bested my previous PR by five minutes. The handful of times I’ve paced anyone it has been friends who are just getting into running. I like being there to encourage and support them, and to remind them that the most important part of running is to have fun. At the last minute before the start of a 10K I decided to pace a friend who was very nervous about running her first race. I had planned to compete in the race, but seeing her so stressed made it clear that I had to run with her instead. After the finish, she thanked me for not letting her walk and for pushing her through the final mile. As it turned out, I could have easily won, but crossing the finish line with her and being a part of her accomplishment was worth so much more. I’m very easy going, quick with a joke, and have been told I have a beautiful smile when I run. I want everyone to enjoy running and racing as much as I do, and if you run with me, I’ll make sure that happens. I always remind people to think about the hundreds and hundreds of miles they’ve run in preparation for a marathon and what an accomplishment that is. A marathon is just a 26.2-mile victory lap. Yes! But I’ll save it for the folks who join my pace group. I’ve run the Boston Marathon on behalf of the American Cancer Society for three years and counting, raising donations and awareness to help in the fight against cancer. 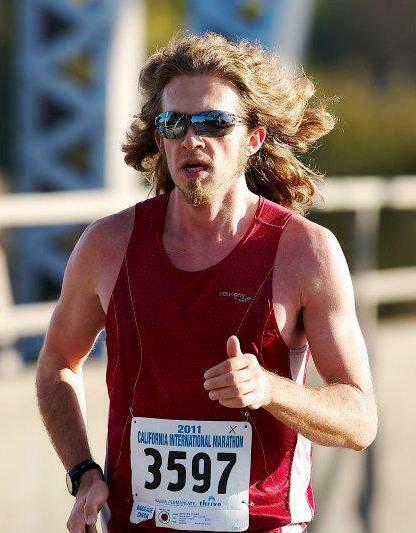 I ran a marathon in 2011 that benefitted Mountain Circle Family Services, a Northern California-based charity that provides support and aid for foster children. After the race I became friends with its organizers at Mountain Circle and have played a major role in planning and growing the event since. Whenever the opportunity to volunteer at a local race presents itself, I’m there. I especially like providing support and information for first-time and novice runners.